Born September 7, 1961 in Fort Worth, Texas. A decorated amateur, Curry posted a 400-4 record and defeated Davey Moore to secure a spot on the 1980 Olympic team but did not compete due to the USA’s boycott. Dubbed the “Lone Star Cobra” for his lightning quick reflexes and hand speed, he dispatched his first 15 foes (including Bruce Finch and Marlon Starling) before capturing the vacant WBA welterweight belt from Jun-Suk Hwang (W 15) in 1983. Five successful defenses followed, including a rematch win over Starling (W 15). Named inaugural IBF champion in 1984, he unified 147-pound titles with a dynamic 2nd round knockout over WBC champ Milton McCrory. Curry was upset by Lloyd Honeyghan in 1986 to end his reign (TKO by 6). After an unsuccessful attempt at the WBA super welterweight strap against Mike McCallum (KO by 5), he rebounded to win the WBC belt with a 9th round TKO over Gianfranco Rosi in 1988. After losing the title in the next year, he lost title bouts with Michael Nunn (KO by 10) and Terry Norris (KO by 8) before retiring. Curry came back for two fights (1-1) in 1997 and retired for good with a pro ledger of 34-6 (25 KOs). Renowned for his precision blend of speed, power and technique, at his peak the 5’9 ½” Curry was regarded as one of the top pound-for-pound stars in boxing. 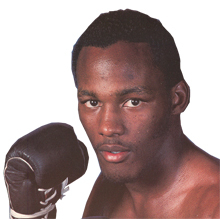 In 1985 he shared The Ring’s “Fighter of the Year” honors with Marvelous Marvin Hagler.